The Cricket World Cup in New Zealand and Australia could barely have gone worse for England, and they came home with collective tails between legs after finishing 5th in Pool A. There’s a quick chance for the test side to put that right and salvage a little bit of pride before the Ashes tour in the summer, when they take on the West Indies in a three-test series starting on Monday 13th April. The first test will be played in Antigua, with the second starting on Tuesday 21st April in St. George’s, and the third on the 1st of May in Bridgetown. All of the tests will start at 3pm GMT. 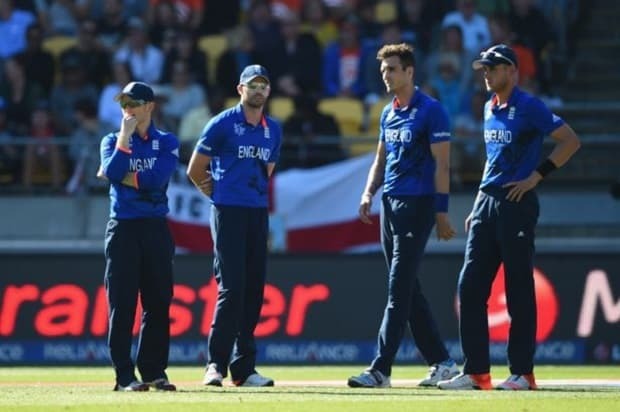 England’s World Cup was shambolic and they suffered three humiliating defeats at the hands of Australia, New Zealand and Sri Lanka. The wins over Scotland and Afghanistan were nothing less than expected, but it was the manner of those three defeats that really hit English cricket hard. The test series is a different game though, and England have a chance to make amends with victory in the three test series in the West Indies. They beat the Windies convincingly by 9 wickets in a World Cup warm-up match in Sydney, and will take confidence from that. The West Indies were lacklustre at the World Cup as well, and although they limped into a quarter-final position, it was an average performance to finish 4th in Pool B, and they were quickly pushed aside by New Zealand. England will be intent on putting the World Cup well and truly behind them, and it’s all change among the squad and coaches as the selectors look to breath fresh air into Alastair Cook’s side. On the coaching side Ottis Gibson has been appointed as England’s fast-bowling coach ahead of the tour, with a chance of pushing his credentials for the Ashes series against Australia in the summer. Gibson fulfilled the role successfully for three years before being made coach of West Indies, a job that he left last August after growing frustrated at the overwhelming task of regenerating West Indian cricket. His vast knowledge of West Indian conditions could prove vital to the England set up. On the playing side there’s a recall for Jonathan Trott after a 16 month absence, and first call ups for Adam Lyth, Adil Rashid and Mark Wood. It’s been a long road back for Trott after he had to leave the Ashes tour of 2013/14 with a stress-related problem, and it wasn’t until the latter part of last summer when he began to show his true form again. National selector, James Whitaker, said of Trott, “He is a player of proven international pedigree and we are delighted to welcome him back into the squad”. Trott will compete for the opening slot alongside captain Alastair Cook, and he’ll be challenged by one of the new boys, Adam Lyth. He’s been prolific for Yorkshire as part of a championship-winning side, and has earned his call up after a number of glittering displays. Whitaker said, “We think he offers us something different at the top as an option, and of course he’ll be pushing for that opening slot. ECB Chairman Colin Graves has described the West Indies cricket side as “mediocre” and said that there will be “enquiries” if England don’t win the series. A 20-man West Indian squad was announced to commence a training camp from the 5th of April, ahead of the first test in Antigua on the 13th. They will be without some of their leading players, such as opening batsman Chris Gayle, who ply their trade in the IPL, and that prompted Graves to declare that he would be disappointed if England don’t win. There is a recall for middle order batsman Darren Bravo, who has recovered from the hamstring injury that forced him out of the World Cup, as well as call ups for the uncapped quartet of Carlos Brathwaite, Miguel Cummins, Shane Dowrich and Shai Hope. It will also be Phil Simmons first series in charge of the West Indies side, having been appointed coach after the World Cup. With England nursing wounded pride and West Indies missing key players, we agree with Graves that it would be disappointing of England don’t win the series. Away from the glare of the World Cup, and against a team at a more realistic level, England can bounce back to form and we’re also tempted by a series correct score of 3-0. We also like the look of a small punt on Adam Lyth to be top England batsman at a very nice price. It’s definitely a risky proposition with it being his debut, and it remains to be seen whether he can oust Jonathan Trott to the opening slot alongside Alastair Cook, but if he gets games he has every chance of scoring. He’s been in excellent form for Yorkshire, helping them to the Championship, and his enthusiasm might be just what England need at the moment. We’ll also have a play on the top England bowler market with James Anderson, who is just four wickets away from overtaking Ian Botham as England’s all-time leading test wicket-taker. He plays his 100th test in Antigua and it would be a great way to celebrate this series by achieving both landmarks. He’ll be fired up and is worth following to take the most wickets among the England bowlers.